Active Release Techniques (ART®) are one of the most effective forms of treatment for repetitive-motion injuries, has helped Olympic athletes achieve gold medals, and allowed injured athletes to return quickly to their training protocols. With a success rate of over 90%, ART® has become one of most sought after soft tissue treatments in the world today. ART® is a patented, state-of-the-art soft tissue system/movement based technique that treats problems with muscles, tendons, ligaments, fascia and nerves. Each ART® session is a combination of examination and treatment. Dr. Lee uses his hands to evaluate the texture, tightness and movement of muscles, fascia, tendons, ligaments and nerves. Abnormal tissues are treated by combining precisely directed tension with very specific patient movements. These treatment protocols – over 500 specific moves – are unique to ART®. They allow providers to identify and correct the specific problems that are affecting each individual patient. ART® is NOT a cookie-cutter approach. 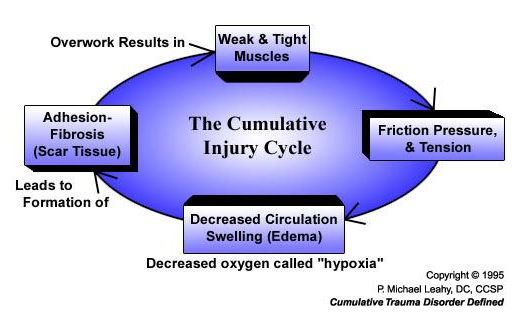 Understanding the process of Cumulative Trauma is key to breaking the cycle of repetitive injury. After an injury occurs, whether it is acute or chronic, your body begins to heal the damaged tissues. The inflammatory process begins as the injured tissues are repaired. 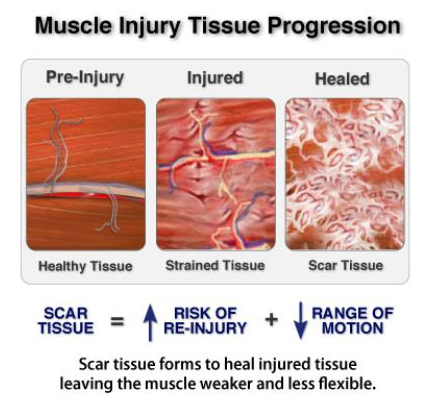 During this process, scar tissue is laid down (just like when you cut your skin) in order to strengthen the weakened structures. This scar tissue does not stretch and is considered “non-functional” tissue. As you become more active and begin to use that part of your body that was injured, the tissues are expected to stretch and slide as you and further injury and inflammation can occur. Decreasing the amount of scar tissue and inflammation is vital in decreasing injury duration, repeat injuries, and thus, avoiding a decreased performance to help you reach your performance goals. The Active Release Techniques are specifically designed to break this cycle and work very quickly and effectively to eliminate long term damage.